Annie Frykholm was a Swedish textile artist, born on January 3rd, 1872. She attended a technical art school in Stockholm. After completing her courses, she took several foreign study trips, where she often visited London where her English relatives resided. Among other things she visited William Morris, a famous textile designer, to gain experience in the modern art industry. She attended important workshops at Morton Abbey and studied South Kensington Museum’s unbeatable collections. 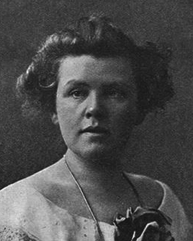 In 1907, Frykholm opened up her own studio, Studio Annie Frykholm in Stockholm. One winter, Frykholm has spent in Italy, and although the purpose of this journey was actually to teach other teaching and not to teach herself, the beauty of beauty in this country with her eyes has also had her significance for her artistry. She was employed as a teacher at the school, teaching textiles. Annie Frykholm’s textile art is strong and representing of joyful bloom. Her compositions are not always what they seem to be at the moment, and they draw further attention unto itself. Her work often has a lot to say in both form and learning, and there is something about her aesthetic that has a quiet yet elegant retreat. Anyone looking for a Frykholm design will be met with balanced and harmonious composition with original colors and noble lines.